I love this time of year, everything feels fresh and new and everyone is ready to take on new projects. The weather in Austin TX.and San Antonio TX. is beautiful and people in both cities are eager to take on new projects. On the subject of new projects I have recently spoken to a bunch of prospective customers who are taking on some really interesting projects using portable storage containers this year. I've heard of storage containers converted into houses, bunkhouse but never a hotel. 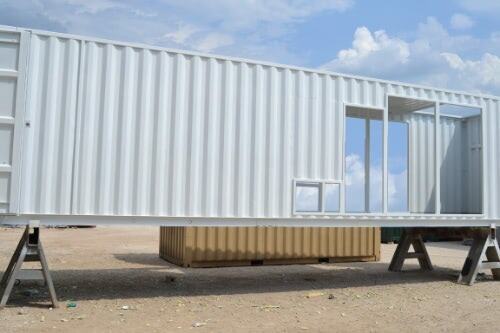 Recently, a hotel was built in Malaysia using storage containers. I found it very interesting because the exterior as well as the interior is made of entirely re-purposed and recycled materials. Based on some of the things I've been hearing recently we may have something like this in Austin or San Antonio someday, pretty exciting!! I recently discussed the benefits of using storage containers to build an art gallery with some local artists- I have seen this done on a small scale and would love to see one use multiple storage containers. Finally, I know this isn't something I heard here in Austin but I was recently watching T.V. and I saw someone using a huge generator that was built in a 40' storage container. What a great idea!! It's portable so you can power equipment in remote locations but more importantly it's secure when it's not in use so you know your generator will be there when you need it. I know a San Antonio construction company that did this on a smaller scale using a container but to see something on such a large scale on T.V. was pretty cool. Post script: Since this blog was published, we've actually made containerized generator enclosures of our own. I've added a picture to the top.